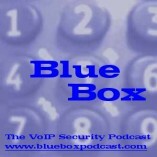 Welcome to Blue Box: The VoIP Security Podcast show #1, an 11-minute podcast providing news and commentary around VoIP security issues. Download the show here (MP3, 10MB) or subscribe to the RSS feed to download the show automatically. 01:06 - Explanation of the term "Blue Box"
03:41 - News of updated Voice Over IP Security Alliance (VOIPSA) web site and the release of the first view of the VoIP Security Threat Taxonomy. VOIPSA is looking for feedback and anyone can contribute through the VOIPSA wiki. 07:20 - Review of the last week's traffic on the VOIPSEC public mailing list, including: softphone security discussion , IEEE Network special edition on VoIP Security, Skype security concerns and a request from Packetizer Labs for beta testers for their new secure H.323 softphone. 09:23 - Wrapup of the show and a thanks to Shel Holtz and Neville Hobson of the "For Immediate Release" podcast.